Soil Yourself This Earth Day - Legends Landscape Supply Inc.
Every April 22, the global population stops, thinks about, and gives thanks to this wondrous planet we call home. We worry about pollution and global warming. We think about ways to conserve water. We think about conserving energy by turning off the lights. And we should also think about – and give some love to – the soil that’s beneath our feet. And perhaps we should dedicate some effort towards taking care of our soil to ensure that it’s healthy, vibrant and can provide us with the vital support we need to survive – and thrive. In other words, soil is alive while dirt is dead. 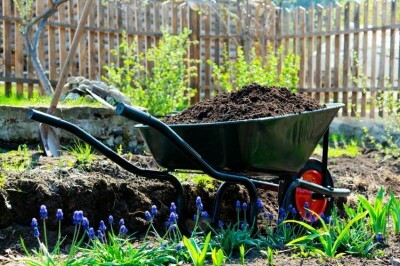 Think about it: when you purchase a bag of lush soil, it feels damp. It easily flows through your fingers. And it has a dark, lively colour which inspires growth. Soil is really cool. And we need to take care of our soil so that it can take care of us. Water your soil regularly: The water features of soil are extraordinary. It can hold a considerable amount of water, but it also dispenses that water quickly. Watering your soil keeps your plants hydrated and prevents your soil from drying out. Give it light: Light is good for grass, plants, produce – and soil too. By giving your soil adequate light, the soil warms up, thus providing optimal conditions for your garden to grow. Use organic fertilizers: Organic fertilizers are derived from animal or vegetable matter, while synthetic fertilizers often have unnatural chemicals, compounds or additives. Given that soil itself is its own living ecosystem, organic or natural fertilizers are best for your soil mixture. The team at Legends Landscape Supply wishes you a Happy Earth Day. Whether you’re planting new soil or laying down interlock and paver stone, you’re doing your part for the planet. And we salute you for it. If you have any questions about soil – including our selection of soils, mulches and aggregates, we want to hear from you. Contact us with any questions you have or advice you need on getting the most from your soil. Written on Wednesday, April 22, 2015.